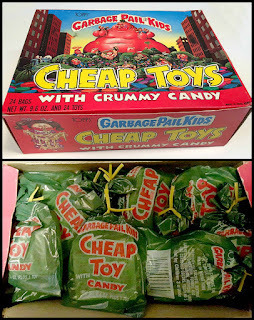 Little Weirdos: Mini figures and other monster toys: Garbage Pail Kids Cheap Toys: Classic GPK mini figures! 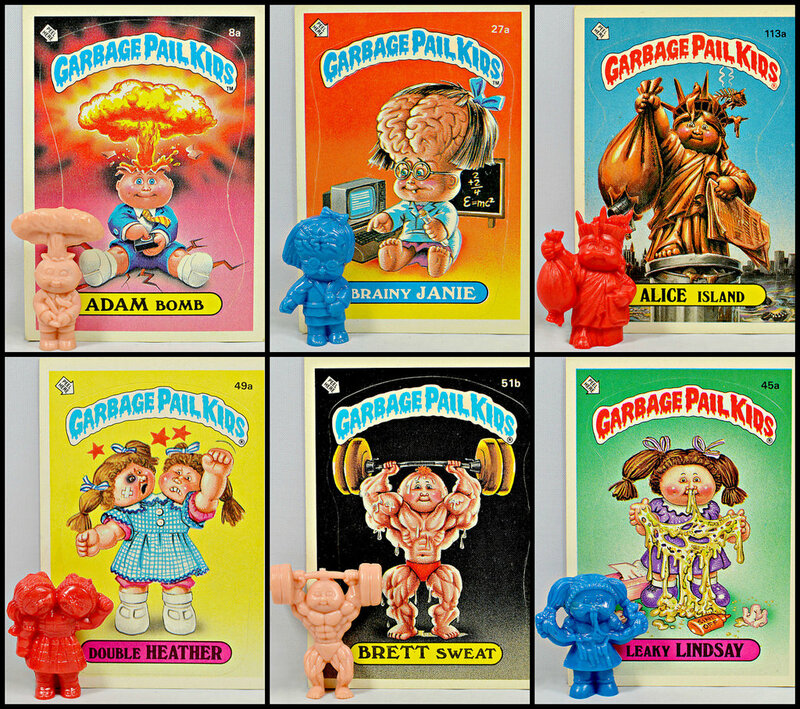 Garbage Pail Kids Cheap Toys: Classic GPK mini figures! 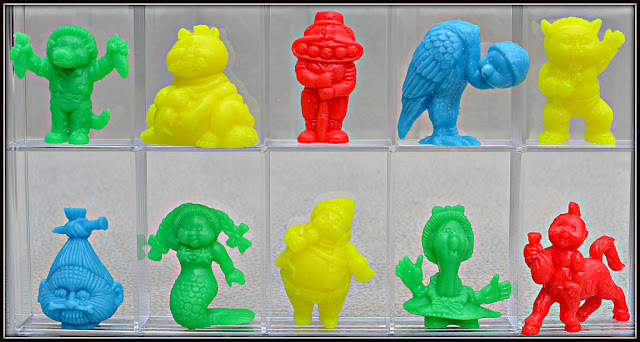 Garbage Pail Kids Cheap Toys are some of the most popular toys among monochromatic mini figure collectors, but I've never done a proper, detailed post on them. It's time for that to change! Topps produced Cheap Toys in the mid-to-late '80s (starting in 1986), after GPK trading cards became popular. It was probably one of the first -- if not the first -- American mini figure lines to use the "blind bag" concept. 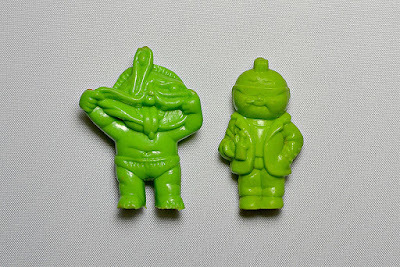 Each figure came hidden in a little green trash bag along with a pack of chalky candy discs that sort of looked like Tums (appropriately billed as "Crummy Candy" on the package). My earliest Cheap Toys memory is being at a mall as a very little kid and getting my mom to buy me one bag at a candy store. I can still remember excitedly opening the sucker while perched at a table in the food court and discovering a flesh-colored Thin Lynn inside. That Lynn was the only Cheap Toy I owned until adulthood, and remains in my collection today (that's her you see at the bottom in the photo above!). As a kid I always wondered what the other figures looked like and if they came in any other colors. Little did I know that there were many variations and even rare colors, or that a second series was produced. Below, we'll take a closer look at this small-yet-awesome toy line. Series 1 is made up of 10 different sculpts, all based on some of the more popular characters from GPK trading cards: Leaky Lindsay, Brainy Janie, Adam Bomb, Alice Island, Brett Sweat, Double Heather, Crater Chris, Graffiti Petey, Muggin' Megan, and the aforementioned Thin Lynn. The four basic, common colors of Cheap Toys are flesh/peach, blue, red and green. There were also less common colors released, including neon red, neon green and neon yellow, among others. I have to say, Cheap Toys colors have always been a kind of uncrackable code to me. There are a bunch of minor color variations, and it can be hard to tell them apart. You can see a color wheel in this LittleRubberGuys.com forum thread. Here's an example of a green variations that demonstrates just how minor Cheap Toys color variations can be. The most common Cheap Toys are made out of a firm, dense plastic, similar to that of a MUSCLE figure. Some of the rarer figures, such as neon red and neon yellow, were produced in a slightly softer, more rubbery plastic. Some later Cheap Toys, including Series 2 (which we'll cover below) and a UK Series 1 release, were produced in a lighter, harder plastic. This material floats in water, while the standard, earlier versions sink. A second series of Cheap Toys was produced, but because of its limited run and exclusivity to Canada, the figures are much harder to find than Series 1. This time, Topps released the toys under a a different company name, Novo Bonbon. The series consists of 10 additional GPK characters, generally including more obscure choices than the first series: Berserk Kirk, Catty Cathy, Les Vegas, Picky Mickey, Distorted Dot, Fishy Phyllis, Still Jill, Mouth Phil, Ali Gator, and Galloping Glen. 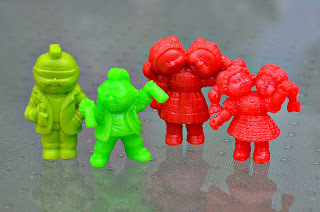 Series 2 figures came in rich red, blue, green and yellow shades, and as mentioned above, were made of a harder plastic. I don't own any, but I did get a set reproduced in rubber by sculptor, caster and fellow collector Eric Nilla. You can see the reproductions below, cast in colors that are similar -- but not exact matches -- to the genuine releases. GPK Cheap Toys have gathered a dedicated collector base over the past decade or so, with some collectors investing a great deal of time and money to track down as many rare variations as possible. This interest in Cheap Toys -- as well as the revival of Garbage Pail Kids cards -- made way for a recent return of GPK mini figures. Topps produced two Series of GPK "Minikins" from 2013-2014, each featuring 26 different sculpts in both monochromatic and painted versions. You can find detailed Little Weirdos coverage of Minikins here. Their smaller size and soft rubbery material, among other things, led to mixed reviews from Cheap Toys collectors -- especially ones who were expecting a modern continuation of Cheap Toys. Personally, I think they're pretty great. And there you have it! You can find much more about Cheap Toys, including a highly detailed history and photo galleries, at GeePeeKay.com. What about you? 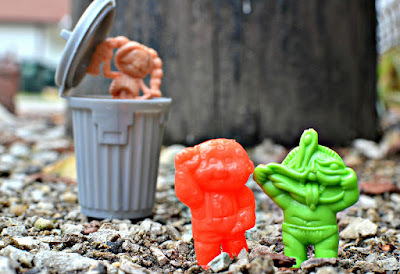 What do you think of the Garbage Pail Kids' plastic representations? Do you have any Cheap Toys memories? Share your thoughts in the comments!